Whether you have a daughter, niece, grand-daughter or another special 5-year-old in your life, these gifts will have them squealing with delight. With such a wide selection of toys, there is bound to be something to fit the personal preference of your little girl. So take a look at these top 2018 toys and be prepared to have the best present at the party! Do you have a budding biologist in your circle? If so, then this is the perfect gift for her. She can satisfy her green thumb while having pride in watching her plant grow. The kit includes everything you will need for this miniature, self-contained eco-system. 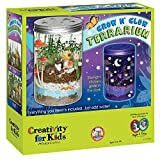 After assembling the container, let her express her own style by decorating it with the included nature themed stickers, some even glow in the dark! Under your guidance, she can then plant the included seeds and watch day after day in anticipation as they grow larger. This is a great toy to teach not just basic plant science but also to allow her creativity to shine! 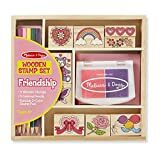 This set brings all of the quality you have come to expect from Melissa & Doug products into an adorable stamp set. Featuring large stamps of balloons, hearts, a rainbow, teddy bear and butterfly, your little girl will be able to embellish cards, envelopes or whatever she chooses. The included stamp pad has both purple and pink sides for more flexibility. With coordinating colored pencils, she can take her creativity even further. So whether she uses this to make cards for her best friend, or maybe a sign for her bedroom door, this will be a hit. This bracelet making kit is great for the jewelry lover! This kit includes enough material to make 28 bracelets, so there is enough to share with all of her friends as well. Using an assortment of vibrantly colored, miniature rubber bands, she can design and make her own unique bracelets, necklaces, rings and more. The rubber bands are latex free so are safe for those with latex allergies. This is a gift that she can play with either independently or have a bracelet making the party and invite all of her friends to join in on the fun! Has your little girl declared she is going to be a fashion designer when she grows up? Then this is the toy you want! You can enjoy the nostalgia this toy will bring as your little girl designs her own pretend wardrobe. The classic fashion plates have been updated but are still as fun as they were when you were a kid. She can mix and match the plates and then use the colored pencils to create her own fun and unique outfits. The included carrying bag keeps everything together and ready for on the road fun. This gift is for your little ballerina! The pretty pastel pink color adorned with dancing ballerinas are sure to delight her. With one large compartment, two small drawers, and a larger drawer there is plenty of space for her jewelry, trinkets or whatever she chooses. Open up the lid to this box and be delighted by the wonderful chords of “Swan Lake” and enjoy the twirling ballerina figurine. The included mirror under the lid is a wonderful touch and will allow your little girl to check her jewelry before running out the door or her bun before her next recital perhaps. This is another nostalgic toy that will bring back your own childhood memories. Updated but still tons of fun, everyone in the family can get in on the swirling action! This set comes with everything you need to start designing immediately. Wheels, rings, racks, pens, paper, and guidebook are all kept neatly organized in the included carrying case. Best of all, with the updated design you have more choices of what pens to use to increase the creativity even more. This will not only be a hit with the gift recipient but with everyone that has a chance to use it! Does your little girl spend countless hours drawing? Then let this toy help her express her creativity while honing her drawing skills. The simple projector comes with 124 slides that can be mixed and matched for various drawings. The projector is incredibly versatile and can be used horizontally or vertically and with simple adjustment can make the project image larger or smaller. With the included markers, paper and pre-printed flip books, this toy is ready to go out of the box! The great thing about this toy is the flexibility, whether young or old, boy or girl, everyone can enjoy making their own silly scenes from the included slides. Does your little girl like playing pretend? Does she fancy herself the next famous architect? If you answered yes to any of these questions, then this is the toy for her. This kit, including 25 balls and 44 sticks, allows for endless hours of building fun. Use the pieces to build a tall tower. Or assemble and cover with a sheet to create a cave full of fairies waiting to play. The possibilities of configurations are endless! Your little girl will learn simple engineering principals while using her creation in hours of pretend play fun. Combine sets for even bigger, crazier creations. The included instructions will help you get the building fun started quickly. If your daughter has expressed interest in sewing, then this is the kit you want to get for her! It includes everything needed to make the illustrated projects including felt, stuffing and sewing implements. The kit also includes extra fabric and ribbons and buttons for added embellishment and creativity. All of this is neatly contained in a metal lunch box type carrying case that closes securely. With such a cute design, this is sure to stoke your little girl’s interest in sewing! Does your little girl like styling her own hair? Does she like doing crafts? Then this will be the ultimate gift for her! This head band making kit will allow her to express her own unique style every day of the year. With enough supplies to make ten head bands, her friends can also get in on the creativity fun. The kit includes ten brightly colored headbands. These can then be embellished with a wide range of included ribbons, rhinestones, feathers, flowers and more. This kit comes with glue so all that is needed are scissors and her creativity. Whether she keeps the headbands or makes them as gifts, crafts by herself or with friends, this kit is sure to be a hit! So there you have it, the ten hottest toys of 2018 for 5-year-old girls. No longer are you confined to dolls? Let her learn new skills, explore scientific principles and express her own uniquely creative ideas!